Private instruction available in person and via Skype. Experience working with a diverse group of individuals including those with mobility challenges and Autism Spectrum Disorder. Please contact me to discuss. 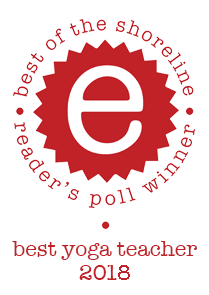 Thank you for voting me Best Yoga Teacher on the Shoreline in the e-list Best of the Shoreline Reader's Poll again this year! Every class you attend, post you 'like,' workshop you come to, and vote you cast makes a difference in the company and in my life. We appreciate everything that YOU do to make Decadent Wellness happen! Thank you! Movement linked together with breath in a flowing practice that includes deep postures and long holds. Physically challenging and designed to help balance hormones for both men and women. Increases strength and stamina, releases toxins, and calms the mind. Each class concludes with deep relaxation and meditation for an effect that is both energizing and soothing. A mixed-level class that is also appropriate for beginners, those recovering from injuries and those wanting to slow down. Cultivate proper alignment and spinal health with this grounding and empowering practice. Breathe, open your heart, move. Improve balance and reduce likelihood of future injuries. Feel more grace and ease as you head back out into the world. Concludes with deep relaxation and meditation. A gentle physical practice including Yin poses designed to help you nurture yourself. Appropriate for students of all levels, including beginners and those with injuries. Slow, deliberate, and meditatively focused. Appropriate for beginners, those recovering from injuries and those wanting to slow down. Reduce stress and fatigue with this soothing practice. Connect your mind with body and body with mind. Concludes with deep relaxation and meditation. Instruction on the basics of practicing yoga while building strength and skill. Taught in a non-heated room, you will learn the basics of sun salutations, foundation yoga postures and shapes, and the importance of connecting with the breath. Suitable for beginners as well as those with some experience who can benefit from revisiting essential alignment, flow, and breath-work principles. See additional monthly and yearly pricing options here.